Slip, Trip and Fall accidents are now reported as having the “highest claims severity” when compared to other compensation claims in the 2015 Benchmark Study of Compensation Claims conducted by Zurich Insurance. While the study was conducted primarily in among workers in hospitals and healthcare organizations, the study provides important statistics that should be considered by any facility manager. STF accidents are not unique to hospitals and the lost work hours and costs associated with claims impacts all companies that experience such accidents. That’s a big dollar amount. But consider this, the insurance study also showed that slip, trip and fall accidents generated 10% longer lost time due to worker injury. So not only are STF claims more expensive in dollar amount but they also cause greater work time loss. With such an impactful loss, those numbers are staggering. Vigilance is important whenever discussing safety of workers. Spills will happen in a plant or warehouse, but it is important to not allow spills to turn into a STF accident that injures a fellow worker and cost the company thousands of dollars. 1. Make sure your facility and production floor is well lighted. Replace defective or old lighting quickly. 2. 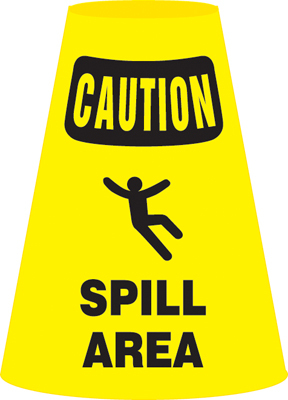 Make sure you have a Spill Control Program and that all the staff responsible know what it is. Your spill response team must be able to act quickly and completely to mitigate risk from a spill. 3. Make sure clean up of spill is complete and institute spill containment measures to prevent ongoing risks from spills or leaking equipment. A metal Drip Pan from Killarney Metals costs an average of $150. Probably one of the most cost effective measures to prevent slip, trip or fall accidents is a simple drip pan. Whether part of an emergency spill control response or used for ongoing spill containment, the simple metal drip pan provides a solutions to keep spills out of the way of workers. Using a drip pan will reduce the risk of losing worker time and money due to STF accidents.